In the following, you find a few examples for the application of computer models in laser technology. See also our tutorial on modeling. It is well known that light can be amplified by stimulated emission e.g. in laser crystals. 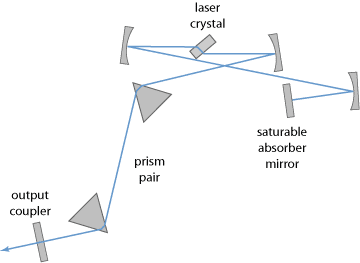 In a laser crystal, additional effects such as gain saturation, gain guiding and diffraction also come into play. But how do all these effects combine in detail? A clear quantitative understanding of such processes is indispensable for the efficient development of laser devices. 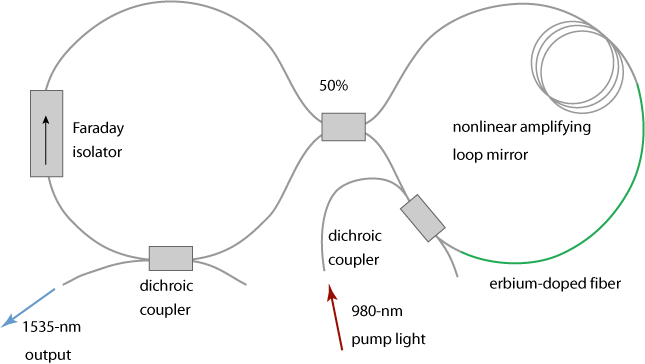 Figure 2: Schematic setup of a simple erbium-doped fiber amplifier. The processes occurring in the active fiber can be well understood and optimized with an amplifier model. A suitable software such as RP Fiber Power can do efficient power propagation, or full beam propagation where needed. It can not only fully treat quasi-three-level systems, but even work with arbitrary user-defined energy level schemes. Figure 3: Resonator setup of a typical femtosecond mode-locked solid-state bulk laser. In a mode-locked laser, a single ultrashort pulse (or sometimes a sequence of pulses) circulates in the laser resonator. In each resonator round trip, it is subject to a variety of effects such as wavelength-dependent amplification and power losses, chromatic dispersion and nonlinearities, and to time-dependent losses in an optical modulator or a saturable absorber. Ideally, a steady state is reached after some number of round trips, so that the combined action of all mentioned effects exactly reproduces the pulse after each full round trip. In other cases, such a stable steady-state does not exist; instabilities can arise in very different ways, which are often hard to distinguish in experiments. Each optical component (for example, the laser crystal, dispersive laser mirrors, and modulator or a saturable absorber) is characterized by various quantities describing its effect on the circulating pulse. Figure 4: Setup of a mode-locked fiber laser. A suitable software such as RP ProPulse or RP Fiber Power can numerically simulate the evolution of the circulating pulse in many round trips. One can, for example, plot various pulse parameters as functions of the number of round trips, inspect the pulse traces in the time and frequency domain for any location and moment of time, or plot steady-state pulse parameters as functions of other parameters such as the pump power, the chromatic dispersion of an optical element or whatever else. investigate possible causes for instabilities. Based on this, one can optimize the laser design for best performance and/or lowest sensitivity to various influences. Particularly for fiber lasers, the interplay of various effects is usually so complex, that without a computer simulation (i.e., only based on a good understanding of the technology) one could not understand which pulse parameters are to be expected, what are the stability limits, etc. For many applications, one requires ultrashort light pulses with high pulse energies and enormously high peak powers. Typically, one first generates low-energy pulses in a mode-locked laser, then uses a pulse picker which greatly lowers the pulse repetition rate, and finally sends that pulse train through a chain of optical amplifiers. Different types of amplifiers can be used, such as fiber amplifiers (providing a high gain, high amplification bandwidth and high power conversion efficiency, but exhibiting substantial nonlinear effects) and bulk amplifiers based on laser crystals. In each amplifier stage, there may be substantial effects of gain saturation, gain narrowing (i.e., a reduction of optical bandwidth due to a limited gain bandwidth) and nonlinear distortions. High-gain systems also exhibit substantial amounts of amplified spontaneous emission (ASE). Often, one needs to prevent such ASE light as far as possible from entering the next or previous amplifier stage, e.g. in order to avoid excessive gain saturation by ASE. For such purposes, one may employ devices like bandpass filters, Faraday isolators and optical switches. Of course, their effects need to be properly treated in a model. In many cases, the principle of chirped-pulse amplification (CPA) is employed, using highly dispersive optical elements like volume Bragg gratings or pairs of diffraction gratings. A suitable simulation software such as RP Fiber Power can not only calculate the characteristics of the output pulses even in complex situations (with multiple amplifier stages, ASE feedback effects, etc. 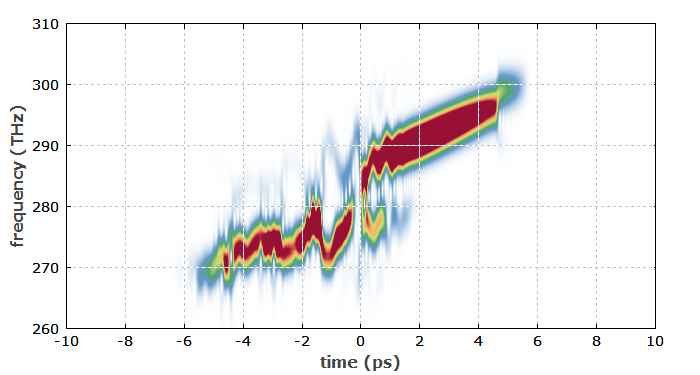 ), but also provides a high flexibility for varying any device parameters, studying dynamical effects, etc. 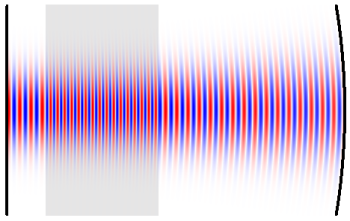 Figure 5: Spectrogram of an up-chirped amplified pulse, where a substantial part of the optical energy was scattered to lower optical frequencies by stimulated Raman scattering (SRS). This was taken from a case study with the software RP Fiber Power. Each one demonstrates that computer modeling reveals not only the expected performance, but also the internal details, which is essential for understanding and optimizing such devices.